Wow! I’m usually skeptical when it comes to fiction on a topic like bullying, because it seems there’s nothing but obvious things to be said about it. This little gem by Belgian cartoonist Max de Radiguès, however, feels every bit as fresh and unpredictable as it feels sincere and essential. Its subtle, sensitive, delicate, rather dark and slightly mysterious storytelling opens up the subject matter to broader moral considerations that don’t come with easy answers, and the result is a powerful, truly memorable reading experience. Highly recommended to fans of alternative comics! Absolutely riveting and devastating short graphic novel by artist Max de Radiguès that is also (I warn you) a little disturbing in places. I hope, now that I urge you to read it through my review, that you won't blame me for introducing you to a couple of these images. But I am just haunted by it in a way that completely surprised me. And when I say "riveting" I am not talking "Batman vs Superman" sort of action, now. It's the riveting of subtle poetry, of Rilke's Panther.His vision, from the constantly passing bars,has grown so weary that it cannot holdanything else. It seems to him there area thousand bars; and behind the bars, no world.As he paces in cramped circles, over and over,the movement of his powerful soft stridesis like a ritual dance around a centerin which a mighty will stands paralyzed.Only at times, the curtain of the pupilslifts, quietly--. An image enters in,rushes down through the tensed, arrested muscles,plunges into the heart and is gone.The boy, Joe, has something of Rilke's panther about him, I think, and the thrill is in Rilke's helping us see this animal and his caged-ness in a new way. You see, I initially thought this was just this simple book about a now sort of commonplace topic: The brutal emotional and physical abuse of a sweet and vulnerable boy. A bullying book! A familiar topic in schools now. An easy target, one might say. A topic for moral instruction. But this book is not a tract for kids to read. It is in fact a bullying book, but it is something almost darker than that. In fact most classrooms couldn't use it because of the aforementioned couple of images, as brief as they may be. It's also (sorry for the slight emotional spoiler) not quite as uplifting as most stories for kids seem to be in schools. Which is one (of two or three) reason(s) why it sort of took my breath away. Surprised me! The art is simple, and lovely and sweet, mostly, and the message is often terrifying, altogether convincingly nightmarish, especially for those going through it, I am sure. There's a darkness under it all, complex and unexplained. We feel that.Oh, but what about the moose, you ask? It figures throughout almost poetically. Joe, our victim, skips the bus each morning so he can avoid his attacker. One morning he comes face to face with an actual moose, who just walks away. And a moose--maybe the same one--figures importantly in the conclusion. But moose are seen and mentioned periodically throughout. It's Canada, and the author lived in Quebec. But the moose is a nice lyrical gesture. Subtly unforgettable, in a way. Makes a "topic" like bullying into something beyond mere analysis. Into the realm of the unspeakable, literally. Into the realm of image, beyond words. Adults figure in largely as bystanders in Moose, people he can't talk to about this stuff. The school nurse is one exception, which is a kind of sweet relief. The conclusion? Oh, you already know I can't talk about it, but I so want you to read it so I can talk about it with you!!! Oh gee's - my second pick of the weekend that I didn't know much about going into it, but turned out to be super dark and written by someone from Belgium! That said, the book was a fairly reasonable balance of ordinary life meets something "worth writing a short comic book about". I'm sure a lot of people who read comics can relate (and those who don't, but they aren't reading this right?) to this bullied kid Joe. But in that way, I think the author's attempt to make the character so self-insert makes the question you hit 2/3rds of the way through the book that much more personal.Would you do what Joe did?I certainly hope I wouldn't, but in many ways it seems justified.I would have liked a bit more explanation as to why Joe couldn't tell anyone. But the fact that he doesn't isn't necessarily bubble bursting. I mean, how many people do just that? I don't think this is one of those topics that we can ever really talk about enough, or write enough about it, because so many people still don't seem to get it. And people of all ages continue to suffer, and sometimes die. Going with black and white for this comic seemed appropriate, especially since it's winter and Joe spends quite a bit of time in the snowy outdoors. It also highlights the bleak outlook of Joe's life. The cartooning style itself struck me as something I've seen in more then one book for younger audiences, so even if it isn't always for younger readers it did end up being a bit of a cleverly deceptive juxtaposition considering just how graphic/dark it gets. That said, it is for teens. Just not as light and fluffy as one might expect. What I thought was going to be a silly highschool tale about bullying turned out to be pretty haunting. It wasn't until half way through the book that I turned to the back cover to confirm that it had a 'mature content' label. So certainly not a kids book - don't judge a book by its cover, eh? Its a story about silent alienation in the face of extreme bullying and it doesn't provide any clear-cut answers. Wow. This story packs a huge wallop. Joe is a shy kid who is being relentlessly bullied at school. There seems to be no end in sight until something unexpected happens ... There is a darkness to this story that belies the open, clear lines of the artwork. On the surface, it would seem to be an anti-bullying story, but there are moral questions to be found as well. Joe's decision is not an easy one to make. The impact of this story lingers after the final page has been turned. A short graphic novel that packs a wallop. The graphics are as stark and grim as the story about a young man who is bullied. The ending presents a dilemma I understand but can not resolve. Thanks, Mark for recommending it to me. Heartbreaking and unflinching look at bullying. I've worked in an elementary school for 18 years and I've experienced the dark side of bullying and it's effects on youth. Moose depicts some powerful scenes of lateral violence with a simple cartooning style. The tragedy of the story is the absence of adult intervention but this unfolds into an even more horrific ending. Worth the investment of time. I read this one in 20 minutes and I think I'll recommend it to my 14 year old. The artwork reminded me of Pascal Girard's Bigfoot and Reunion which are both compliments. Very short, strange graphic novel about bullying. It took an unexpectedly "adult" turn in the middle, and the ending was so vague I was wondering what the point of this book was. The artwork also wasn't as polished as I like. Meh. The art was fair (no complaints). The plot has potential. It doesn't go very far or deep, but this is hardly surprising when you consider the length of the book. The characters are unfortunately, "stock". 1: The mindless bully who has no purpose in life except to pick on 2. the weak and simpering kid who just turns over and takes it. And then there are 3. the friends and people around who can see what's going on and do nothing to interfere. Yes, some of the episodes of bullying were uncomfortable to read, but without any depth or value to the characters themselves, I just didn't care. Not about the bullying, nor the "moral" dilemma at the end. What kept coming to mind while reading this was, "I wonder if the author is enjoying drawing these bullying scenes..." Because, in such a short book, there's a lot of them....I liked the moose. I read this because we were discussing how it made it onto lots of top comic lists for teen readers but we cataloged it in adult. I understand the cataloging since our YA section is both a mix of middle and high school materials and this definitely is very mature content.The story deals with bullying, and not just being picked on, but physical violence and a level of abuse that was disturbing. I think it is a powerful story that will find its way into the hands of readers that need to find it, but I can understand why we opted to put it in the adult collection. Joe is bullied, daily, severely. He avoids taking the bus to or from school; he hides in the janitor's closet, all to avoid Jason--who isn't about to let himself be avoided. But then things reach a tipping point. The bullying could stop, forever. The first half of this seems like it would be great for a middle-school, but then there's some ... more mature content, and a morally gray* conclusion. High school, or adult, though the characters are in junior high or HS (not sure). *"Morally gray" is putting it mildly. I shall say no more. I clearly missed the "mature content warning" on the back of the book when I picked this up, not that that changes my feelings about it... but man, I was not prepared for that ending! Overall a wonderful read about a sweet boy who is bullied beyond his limits and how seeing a Moose can change everything. Read this on my lunch break and WOW it was definitely not what I had anticipated, even with a warning from my coworker Darren. The minimal and youthful drawing style made me think the kids were much younger and had me unprepared for the mature and dark content of this book. But it was extremely well done and just a sad portrayal of bullying. I read this graphic novel to find out how graphic the story line was. One boy, who has two mothers, is being bullied at school. He is not talking to any adults about the situation. The school nurse figures out what is happening, but she doesn't report it. The nurse has a secret of her own. The book made me feel sad and I prayed that this type of bullying was not happening to my sons. Un histoire sur l'intimidation très sombre.Le développement des personnage est très limité. Dark. The ending lingers with you for a while. Really interestingly done. Un récit superbement glaçant sur le harcèlement. bullying is for losers, but what we could do better to stop bullying? Dayum - that got dark, son. I'm a sensitive comics-loving dork - and always have been - so high school was the worst. Obviously. But, aside from a general misunderstood-white-teen-in-suburbia sort of angst, I never had to deal with being bullied or abused or anything like that. 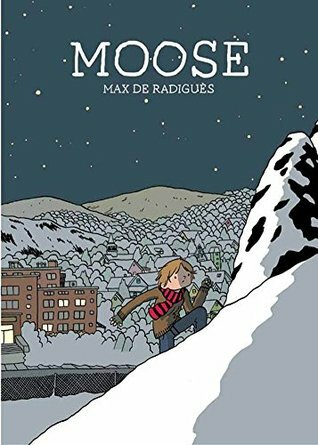 In Max de Radigues' "Moose," his protagonist, Joe, isn't so lucky. Relentlessly tormented by a bully, Joe leads a very solitary life, often preferring to be out in nature instead of around people, constantly looking over his shoulder for the next confrontation. What happens next shifts the balance of power in that relationship and ultimately determines whether or not you'll enjoy the book (that's kind of a clickbait-y sentence... sorry).It's hard to get too into "Moose" without giving away its wrenching and ambiguous ending. All I'll say is that, after witnessing the daily torments of Joe, the "what-would-I-do-in-his-situation" question the reader is left with isn't as black-and-white as it might first appear. It's the type of comic that'll rattle around in your thoughts for much longer than it takes to actually read the book. The snowy locales work perfectly to reflect Joe's loneliness and isolation and de Radigues has a very pleasant almost James-Kochalka-y drawing style. It never comes off as preachy, trusting the reader is smart enough to fill in the blanks about the bully's motivation and other plot elements. In every sense, "Moose" takes a great less-is-more approach. "Moose" will make you uncomfortable, but in a worthwhile way. Are you a bully? A victim? A silent accomplice? A witness? What share of the blame does each role deserve? And what's the appropriate consequence of all that violence? I read "Moose" a few days ago and I'm still wrestling with the answers. It's a remarkably thought-provoking comic. This book is a cute little square full of squares. At first, the art style reminded me of that reliable Sunday comic strip chuckle-maker, Wizard of Id. Additionally, with a title like Moose, I started hoping for cute wildlife and a few giggles. Instead, I am bowled over by the sheer fear, brutal winter, and teenage angst/hormones expressed in each subtle panel. It is a disturbing book, but it's also real. It'll confront you with the alliances and fear of school years. It'll make you cheer for a dark end. Poetic and stunning; simple and exquisite - don't pass this up. This was hard hitting. I really liked the drawings and how sweet and unassuming the kid was. This story was gripping and heart breaking. I kind of sided with the kid with leaving the bully in the hole. Deserved it. Good storyline, and I want to read more Radigues. it was a horrible book. This was dark and unpredictable...two of my favorite things! Well, that ended exactly liked I hoped it would.